MORRISVILLE, N.C. - April 14, 2015 - PRLog -- Author Carey Parker releases a step by step guide to computer security for the not-so-savvy user. 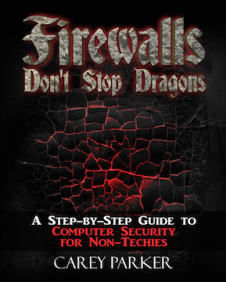 Firewalls Don’t Stop Dragons is a quick and easy read with tips for online banking and shopping, password security, preventing identity theft and basic cybersecurity. Sprinkled with pictures and humor, this book is for everyday computer users - parents, grandparents, teachers and is structured to give the reader maximum benefit with the least amount of effort and cost. "I wrote this book because most people have no clue how to protect themselves online or keep their computer secure, but it's become critical that they do so." When asked what the number one security tip he would give computer users wanting to keep their online information safe, Mr. Parker responded "I think the simplest, most effective thing most people can do is to beef up their account logins: use a password manager to create random, unique passwords and enable two-factor authentication where you can." "The bottom line is that you should not know any of your web site passwords. Any password you can remember will have some sort of inherent pattern, and the bad guys have gotten really, really good at predicting those patterns. The human brain is just not up to this task. The only possible way to create an unguessable, unique password for every online account you have - and be able to instantly recall them all - is to use a password manager. What is a password manager? A password manager is some sort of software application or web browser plugin that helps you to generate truly random passwords and then remembers them all for you. A good password manager will automatically fill in these passwords for you on web sites that require a login and even synchronize your “password vault” across multiple computers and devices so you can access them anywhere. Now, if I’ve done my job here, there should be all sorts of sirens going off in your head. If you’re properly paranoid, you must be screaming right now: “Why on earth would I trust all of my passwords to some unknown third party? What if they get hacked? All my eggs are in one digital basket!” And guess what... you’re absolutely correct. However, I’m here to tell you that it’s still the best option available to you. The pros far outweigh the cons; the benefits trump the risks." Carey Parker was born and raised in Indiana, an only child who loved to tear apart his electronic toys and reassemble them in interesting ways. He began programming computers in middle school when personal computers were just starting to become popular. For years, these twin interests percolated until he attended Purdue University and he learned you could get paid to do this stuff - it was called Electrical Engineering! After obtaining a bachelor's and master's degree in EE, Carey launched his 20 year career in telecommunications software development at Bell Northern Research. In recent years, particularly after the Edward Snowden revelations, he became deeply concerned about computer security and privacy. In 2014, he combined his passion for computers, cybersecurity and fantasy novels with the long-time desire to write a book. You may also follow Carey on his blog (http://firewallsdontstopdragons.com/), Twitter (https://twitter.com/intent/follow?screen_name=WawaseeMedia) and Facebook (https://www.facebook.com/pages/Firewalls-Dont-Stop-Dragons/714518098626995?fref=ts).